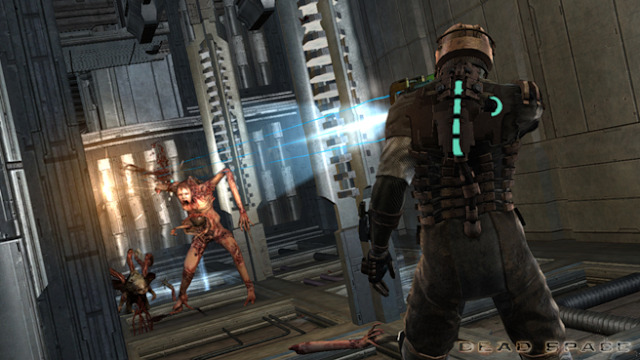 Dead Space is a sci-fi third-person survival horror game developed by EA and released in 2008. It is available on Xbox 360, Ps3 and PC. The game involves lots of combat, resource management, puzzles and a lot of jump scares. First few moments of the game's introduction. 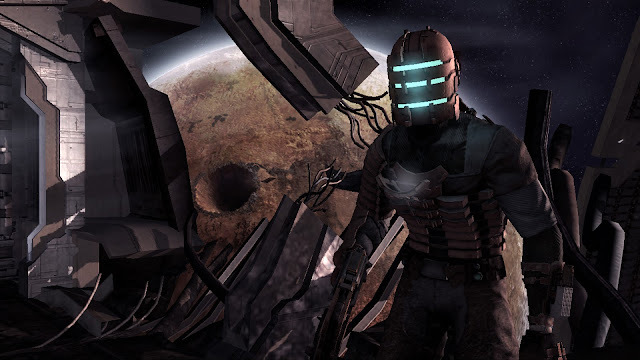 Dead Space is set in the year 2508 and humans have exhausted most of Earth's resources and now use giant mining ships known as Planet Crackers, to harvest the resources of dead planets by hauling huge chunks (billions of tons) of the planet in to space to be processed. 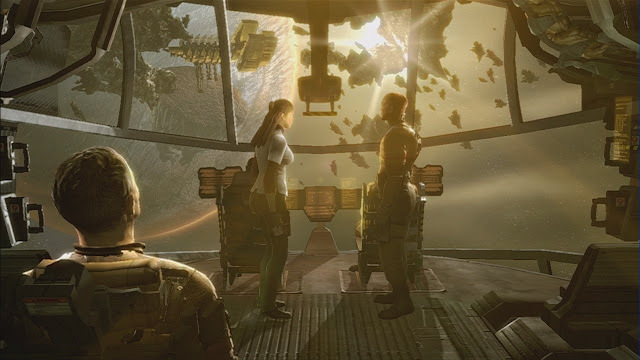 You play as Isaac Clarke, an engineer called to repair one of these giant ships mining a planet named Aegis Vii, named the USG Ishimura, after a distress signal is recieved. When you arrive on board, the ship is empty and the crew is nowhere to be found. You are quickly introduced to Necromorphs, the reanimated and misshapen corpses of the crew that will kill anything in sight. 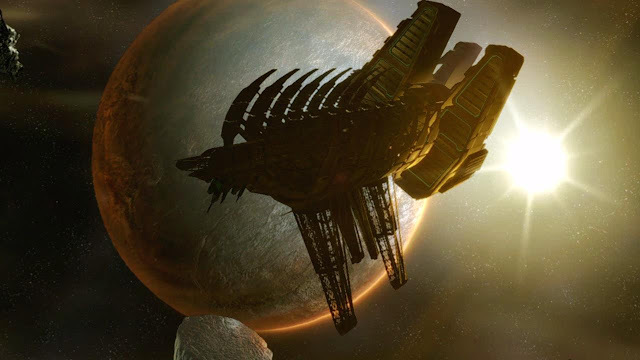 Your ship is destroyed and Isaac is separated from his repair crew, must find a way to escape. Not so subtle tutorial tip. Dead Space's controls are smooth, responsive and feel weighty. Isaac purposely feels slow and clunky, but this actually helps to improve the feel of the game as it means you can't just dodge attacks or conveniently run from enemies. It helps to make fights more intense as enemies are fast and agile and can easily catch up to you if you don't cut them down. 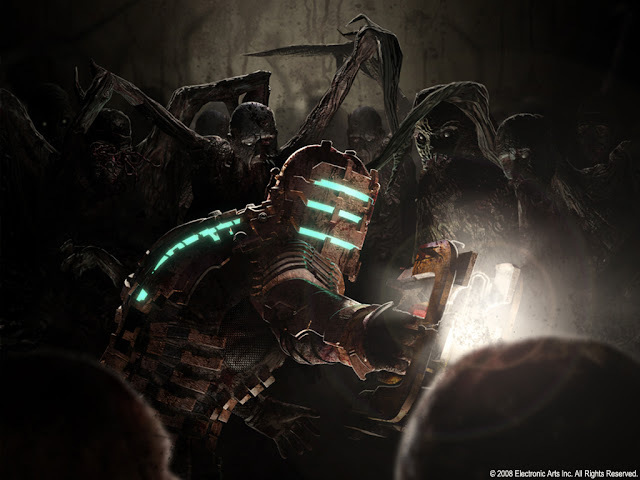 Isaac Clarke is a normal engineer with no combat training or knowledge of these monsters. He never speaks, besides from the odd grunt, and we only see his face once in the game. His only weapons are improvised mining tools that were used to help process rocks and minerals on the ship. The interesting thing about these weapons is that there is no H.U.D to display ammo, health or resources. Instead all information the player needs is displayed in the game world. 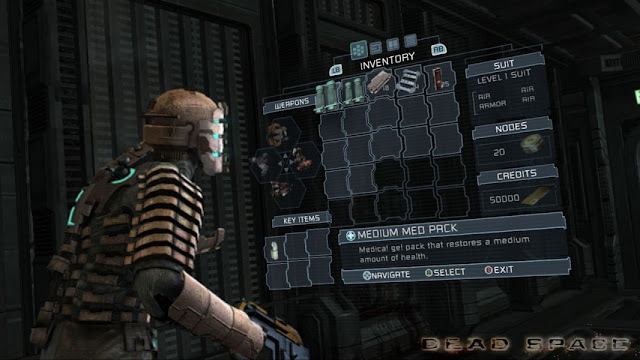 Ammo is shown on the weapons you use when aimed, health is displayed on the back of Isaac's suit as a vertical blue bar that gets lower as you take damage, pickups are displayed as holograms on the floor when you get close and all video interactions are done via hologram that comes from Isaac's suit. Even the aiming reticle is a real thing in the game world, as each weapon has a laser that creates a blue beam between itself and any target to help aiming. These ideas are ingenious as they help keep the player immersed. Even the inventory screen is displayed via 3d hologram and in real time. USG Ishimura in full view. The Ishimura is a gigantic ship that is bigger than a city. It is so large, it requires a tram system just to get around! You are sent around the ship by your crew members, who communicate with you via hologram, to repair damage to various parts of the ship so you can call for help and escape. The ship is broken up in to various sections with vastly different tones to them, you'll find yourself wandering through the dark and empty medical bay, the green and overgrown hydroponics section, the gritty and dirty mineral processing section and so on. 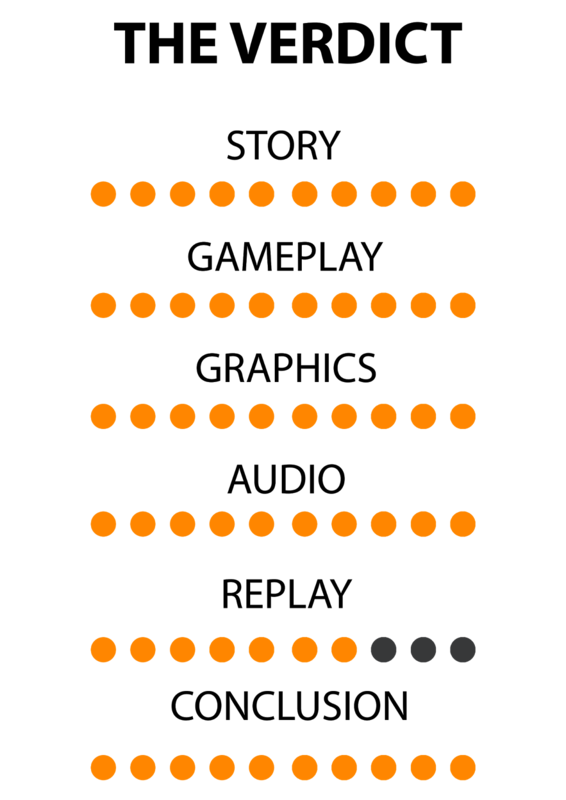 Most of the game is spent inside the ship, so it's impressive that the design team managed to make each section feel distinct and completely different from the others. The levels are generally bloody, dark and narrow to make you feel claustrophobic and trapped, which works very well as this makes fighting the hordes of Necromorphs much more tense as they can come from any direction through the vents. Isaac aiming at a necromorph. Necromorphs are a very unique enemy as unlike normal zombies, shooting them in the head will not work. No matter how many bullets you fire at them they will never die. The only way to "kill" a necromorph is to put it in to a state where it can't attack you anymore, which is done by dismembering it. Cutting off the head only makes it angry and flail blindly in every direction trying to find you, cutting off the legs will just make it crawl towards you and cutting off an arm doesn't change it's behavior at all. You can't run from these enemies because they can just follow you through the vents and get you again later. Each new enemy type provides a different challenge and forces you to change how you tackle them. For example, there are enemies that move incredibly fast and cannot easily be killed without the use of your Stasis module, which is a refillable ability that slows down any object or creature you throw it at for a few seconds. This feature is used cleverly throughout the game both for puzzles and combat. The last ability Isaac has is a telekinesis module, which allows him to pick up and throw most objects. 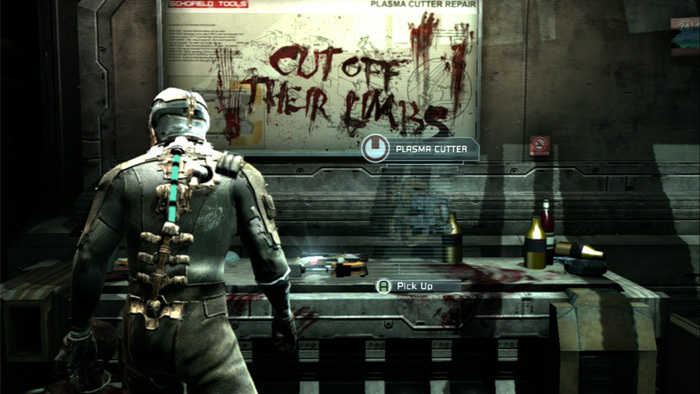 Objects such as saw blades, poles, necromorph body parts and boxes can be picked up and thrown as deadly weapons, which is very fun to do as it is an excellent way to conserve ammo, which can be scarce. A look at the inventory. Power nodes and other valuable items are scavenged from the environment and enemies that can be used in the store or used to upgrade weapons, tools and your suit. This game has deep mechanics and plenty of variety to how you tackle a situation, which keeps the game very interesting and fun to play throughout its 14 hour campaign. There are multiple times where you are asked to solve puzzles within a zero gravity environment. In these areas, every single object floats and uses realistic physics to help make it much more believable. 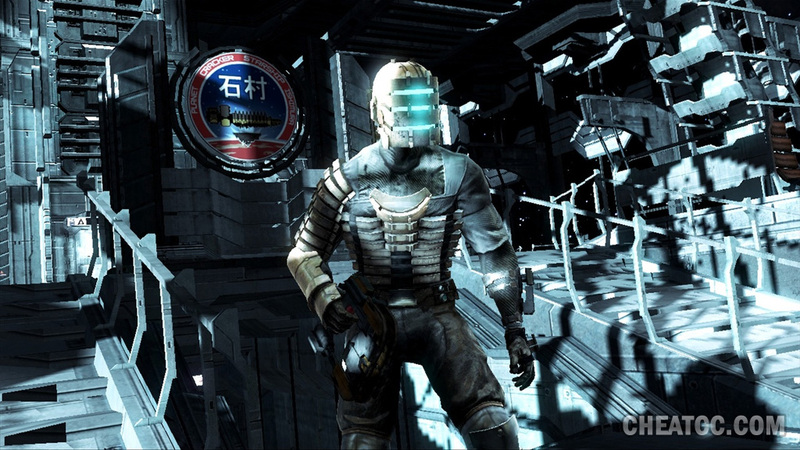 Isaac's suit is equipped with magnetic boots that allow him to walk across the surface of a ship's hull when on repair missions. You can aim at a surface and jump across the room towards it for quick traversal of the environment. Zero gravity or even vacuums are surprisingly not able to stop or even slow down the necromorphs as they always find a way to cling to surfaces and attack you. This is a horror game above all else and does an excellent job at removing you from your comfort zone. Necromorphs can attack at any time from any direction and will usually do so loudly. They burst from air vents and sprint at you from around corners to scare you. The only issue with this formula is that the game relies on jump scares quite a lot, which can lose their effectiveness over time and become predictable. The game's atmosphere and constant feeling of isolation and dread never leaves and remains effective throughout the entire game. One of the few bright areas. 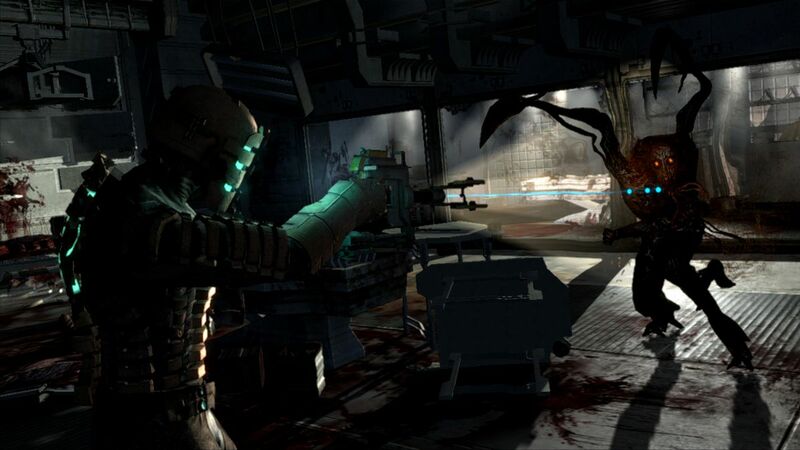 Dead Space's graphics were incredible at the time, the game uses lighting effects to create very realistic shadows that can be used to mess with the player's expectations and create some creepy moments. The Ishimura's interior is grimey, dark and industrial, which suits the purpose of the ship very well. This game makes great use of visual storytelling, where clues in the environment give you an idea as to how corpses found on the ship ended up there or hints towards something much bigger and more sinister behind the scenes. Scribbles can be found written everywhere by the crew, with incomprehensible images, writing and shapes, making it obvious that the crew had gone insane prior to your arrival. The necromorphs look incredible and creepy because the design team studies car crash victims and studied anatomy to make the enemy designs believable. All shapes that the necromorphs are twisted in to are possible and simply repurpose bones, muscle and tendons to create new appendages and weapons. 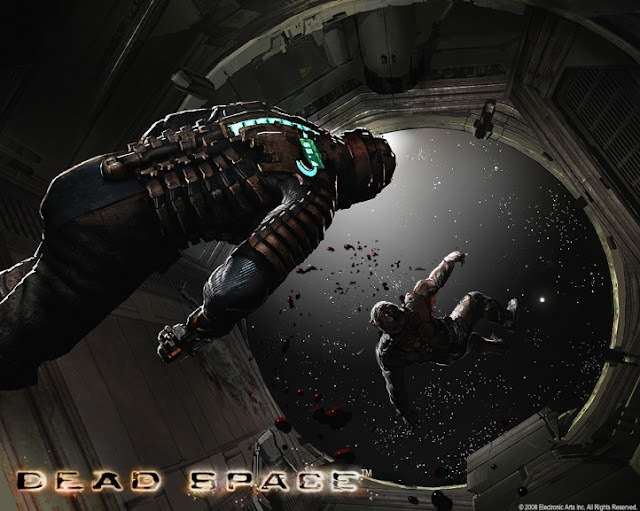 The sound design in Dead Space is some of the best I have ever come across. The ship is mostly silent and every movement you make creates a loud noise that gives away your position. In the distance you can hear shuffling in the vents overhead, hear objects being knocked over and sometimes voices. The sound of machinery is almost always too loud and makes you want to get away from it as soon as possible. There is a certain room that takes advantage of this later on where there are no enemies at all, but there is a very loud machine running that makes you want to get out of the room quickly. The music in the game is minimal and only plays when enemies are attacking. Layers of music are added on and climax when you look at an enemy, which adds to the immersion as the music is supposed to represent our silent protagonist, Isaac's fear. The sound quality is so good, that a single clumsy footstep can be enough to alert you to an enemy only inches away from sneaking up on you from behind. Broken area of the ship. The game features multiple environments that involve Isaac walking across the hull of the ship, where a full view of space and the planet below are shown. The lighting looks spectacular and the more subtle effects such as sound being muffled hugely because the sound is travelling through the floor and into your body help to make the game feel very believable and accurate. The designers made a tough game that will likely kill you a lot. This is one of the very few games where dying can be entertaining, a huge amount of work went in to Isaac's deaths. Every enemy has a unique grab attack that will tear Isaac apart in various horrible ways should you fail to escape, he also has many gruesome death animations from the industrial environment and machinery. Subtle environmental details and collectible items and trophies are the only things you will miss while playing the game. All environments are mandatory and no content will be missed by the player. New suits and weapons are unlocked after completing the game and the hardest difficulty becomes available to players who want an even greater challenge. I personally think more could have been added to make multiple playthroughs more interesting, but none of that takes away from the quality of the game. Dead Space is one of the best survival horror games I have ever played. It takes elements from Resident Evil 4, Event Horizon, System Shock and The Thing and melds them into a creepy, fun, immersive and bloody experience that anyone should be able to enjoy. If you're a fan of horror games or third-person shooters, you need this game. It is mechanically flawless and is very impressive in every other aspect. Verdict: 10/10. Despite not having massive replay value, this game is a solid 10/10 on the first playthrough.